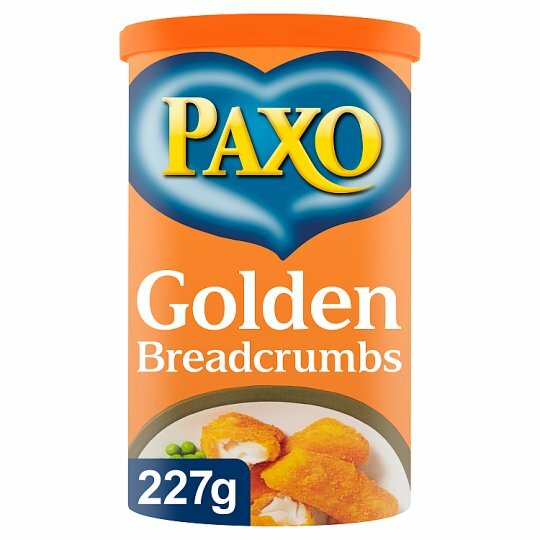 Paxo Golden Breadcrumbs provide the perfect coating for fish, poultry, meat or vegetables. Easy to use, they are also ideal for sprinkling over baked or grilled dishes to provide a delicious crunchy topping. Some settling of the contents may have occurred during transit. Why not try some of these recipe ideas? Breaded Chicken Fillets - Dip chicken fillets in flour, beaten egg and Paxo Golden Breadcrumbs before cooking. For extra flavour, add your own blend of spices to the flour before coating with Paxo Golden Breadcrumbs. Breaded Plaice - Dip plaice fillets in flour, beaten egg and Paxo Golden Breadcrumbs before cooking. Try oven baking plaice fillets for a delicious, healthy alternative to fried fish. Breaded Garlic and Herb Lamb - Mix together, garlic, parsley and rosemary with Paxo Golden Breadcrumbs to make an ideal coating for lamb chops or steaks.